1. The first study compared 4 different groups based on 2 types of school, public vs. parochial (which I’ll refer to from here on as ‘Religious’) and 2 types of student, churchgoers vs. non-churchgoers. Which created 1 non-religious group (Public School non-churchgoers) vs 3 religious groups (Religious & Public School churchgoers and Religious School non-churchgoers). After the recognition test (in which all children performed well), part 2) of the first experiment employed ‘new’ short stories based on biblical narratives, including typical biblical names for characters, but varied the events described so that they were either realistic (no intuitive causal violations), religious (the original biblical causal violations) or fantastic (invented causal violations). 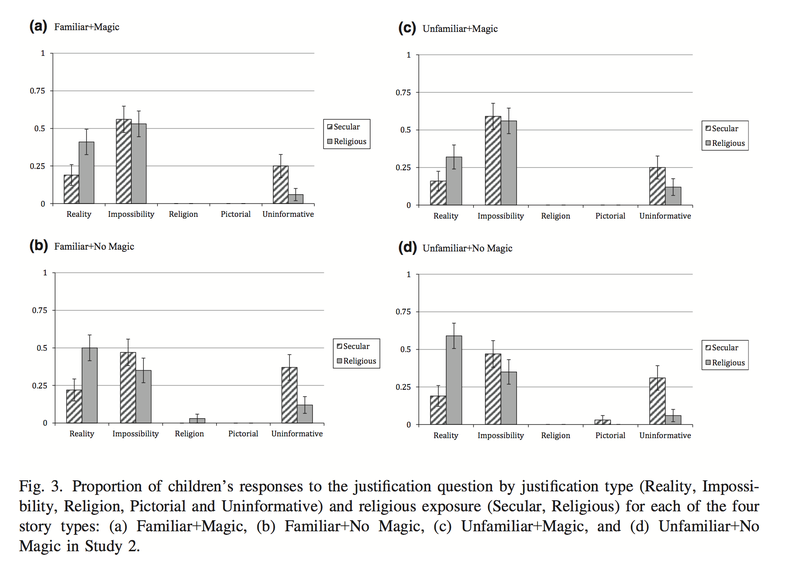 The main finding reported was that all three of the religious groups judged not only the religious versions, but also the fantastical versions as more likely to be true, while the non-religious children tended to classify both the religious and fantastical narratives as unrealistic (see the graph below for an illustration). 2. The second study compared just two groups; Catholic children from (presumably Catholic) religious schools and children with no religious exposure from public schools. This study used the same setup as the first and again in part 2) drew the narratives for the ‘new’ short stories from biblical stories but this time they changed the names of the characters (i.e. John instead of Moses). They also removed the realistic versions, keeping only religious (familiar) or fantastical (unfamiliar) versions and adding an additional variation as to whether the story made reference to magic or not. The study found that from the four ‘new’ types of narratives created, the non-religious group consistently categorised the protagonists for each type as ‘pretend’, while the religious group performed at around chance for all types of stories and hence ‘failed’ to properly identify the invented fantastical fictions. The authors take their results as evidence for the hypothesis that “even if children have no natural inclination to believe in divine or superhuman agency, religious instruction can readily lead them to do so” but also note the alternative possibility that “children are disposed to credulity unless they are taught otherwise by their families” (p.23). They conclude however that “it is more plausible that a religious upbringing overcomes children’s pre-existing doubts about whether ordinarily impossible events can occur than that a secular upbringing suppresses children’s natural inclination toward credulity” (p.23). Or to put it simply, religion encourages faulty thinking and damages the ability of children to tell fact from fiction. Unfortunately, the study contains some rather significant methodological flaws which makes the reported results and their interpretation questionable, and while I have my own reservations concerning “Born Believers”, this paper isn’t actually relevant to that hypothesis. Before I begin, for transparency, I am a researcher working in the Cognitive Science of Religion (CSR) field and thus you could argue I am primed to be defensive of CSR research, however I am also an atheist who is not an advocate of the “Born Believers” hypothesis, so I really have no horse in this race. I study religious beliefs and practices because, regardless of the reality of their claims, they have a definite impact on societies and people, and their worldwide popularity and impressive historical resistance imply that they occupy a cognitive niche that may have been important for our evolutionary development as a species. A troll warned Mike about a flood that was going to cover the Earth. Mike and his wife built a giant boat using magic wood and gathered two of every kind of animal before the flood came. They were very worried but Mike, his family, and all the animals drifted for days until they reached new land. The authors emphasise that they used events which do not appear in the bible (hence, in the examples, the mountain splits instead of the sea and it is a troll and not God who warns Noah/Mike about the flood) but they fail to acknowledge the significant potential confound that comes from drawing the narrative from a religious source. This is a problem, because if I asked Christian people to identify the basis of the above stories, I would be willing to bet a significant portion would explicitly recognise the narrative skeleton of the parting of the red sea by Moses and Noah’s building of the ark and those that didn’t explicitly recognise the story would be likely to still unconsciously feel that it is familiar. The authors argue that their follow up questions take care of this issue since none of the children justify their decisions for categorising the characters in the ‘unfamiliar’ narratives by making reference to religion, however it is important to note that this is also the case for the stories which are supposed to represent the ‘familiar’ biblical stories. That is, the children involved in the study, both secular and religious made practically no mention of religion in any condition in experiment 2 when justifying their decisions (see the graphs below). Consequently, that they didn’t refer to religion for the unfamiliar versions cannot be used as evidence that the narrative was suitably distinct from the biblical narrative, unless the claim is that all of the narratives, including those supposed to reflect the biblical stories, were ‘unfamiliar’. My contention would be that the inverse is true, that is; all of the narratives were ‘familiar’, or to put it another way ‘quasi-Christian’, due to all of the versions relying on biblical sources for their narrative structure. Thus, they provide an unsuitable means to measure responses to ‘novel’ non-religious, fantastical material. Instead, what the authors ended up asking the children seems to be more akin to whether thinly veiled analogies to Christian stories were real or ‘pretend’ and hence, it is not particularly surprising that they find children from religious backgrounds more inclined to say real. Note that there are practically no ‘religion’ justifications provided for classifying story versions A & B despite the fact that they were intended to represent ‘familiar’ religious narratives. …theorists studying religious development… have proposed that young children have a natural inclination to believe in beings with extraordinary powers. For example, in his book Born Believers, Barrett (2012) argues that because children readily see the natural world as designed and purposeful, they are disposed to believe in a powerful God… Thus, even in the absence of explicit religious instruction about divine miracles, when children listen to a narrative that includes ordinarily impossible events, they might be prone to accept the existence of extraordinary beings who can bring them about. 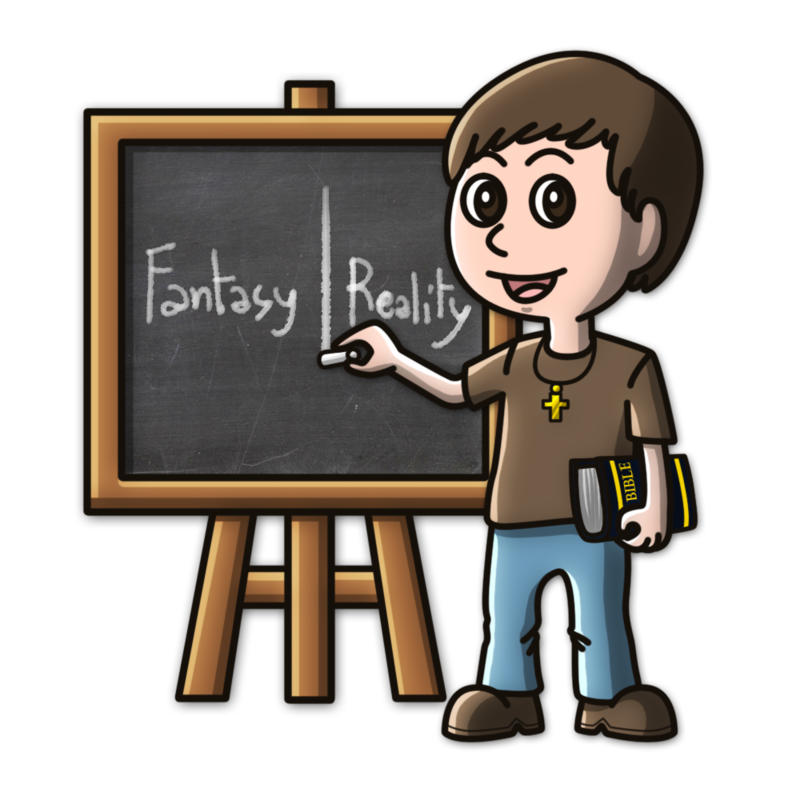 On this view, secular children should not differ radically from religious children in their judgments about biblical stories. In particular, they should accept that a real protagonist might be involved in a miraculous event. The problem here is that just saying ‘On this view…’ does not actually mean you have faithfully represented the argument. Researchers, like Justin Barrett, have suggested that very young children find religious beliefs appealing and display intuitive biases that make them receptive to religious stories/teachings (e.g. teleological purposes for animals/objects). However, no researcher advocating that position has ever argued that children cannot be encultured by the age of 5/6 to be skeptical of religious or fantastical stories. Their argument is instead that to do so, due to intuitive biases, would take more effort than it does to enculturate a child to be religious. Hence, even ignoring the issues above and accepting the studies findings as valid, what the researchers have found provides no evidence for or against the notion that we have early developing biases that make us receptive to popular religious narratives/teachings. 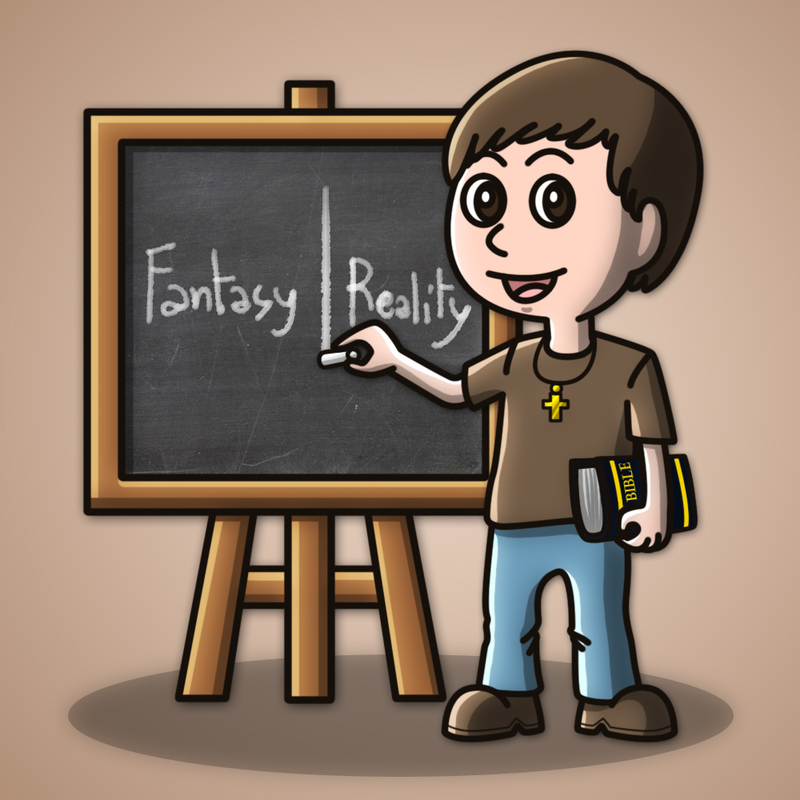 It just shows that children can be taught to be skeptical of the veracity of fantastical narratives, a point that no-one in the “Born Believer” camp has disputed. Indeed, the study authors explicitly state in their discussion that “some secular children displayed an attitude of active skepticism toward religion. They referred to God to justify their categorization of a story protagonist as pretend” (p21), making it self evident that they are relying on values and perspectives which have been encultured. A lot of the evidence for the “Born Believers” hypothesis in contrast comes from research conducted on non-reflective ‘hot’ cognition and shows that children possess a host of automatic intuitive biases, which appear to be universal and not reliant on enculturation. The ability to judge a character in a story as being fictional is thus irrelevant to the question of whether humans possess early developing intuitions that make religious beliefs easy to pick up. Another limitation of the study, which the authors do half-heartedly acknowledge, is that there could be alternative confounding variables that account for their results other than exposure to religion- such as quality of schooling, household income, education level of parents and so on. However, the study doesn’t report any details concerning the children’s family demographics, an oversight which is somewhat understandable given that children were the subjects, but which could have been addressed by a) asking the kids simple questions (what do your parents do? or how many cars do you have? ), b) following up and contacting parents directly/through the schools involved (since presumably they had to give consent to their children taking part) or c) providing some basic profiles regarding the school (i.e. the average income of student’s families, the general position in local area/state rankings, etc.). Similarly, the authors don’t report how many schools the sample is drawn from in either study or whether the students in each group came from the same or different schools. In summary, while this is an interesting study of enculturation and the impact of familiarity with and belief in Christian religious narratives, the way it has been framed by the media, commentators and the authors is extremely misleading. There are good reasons to question the significance of the results reported but unfortunately the reception it has received instead provides a clear illustration of how people are generally ready to accept research findings, as long as they fit with their existing biases. Superb review, Chris. That helped a great deal. I loved your self-disclosure part — I wish more authors did that. Thanks Chris, great exposition, especially on the “born believer/belief instinct” aspect. And your conclusion in the final sentence? Spot on! Feel a bit behind the times but looking at Cognitive Science today I can see it is the highest ranked article according to their article tracking metrics so maybe it’s good to have more critical posts like this floating around for people to discover. Chris — where do you get the tracking metrics? Oh, and btw, I love your Thai artist’s work in this post! Look for the small widget near the middle saying AM score and click on it. It’s surprisingly detailed. And yeah piemboons artwork is amazing, I am constantly impressed. Fascinating — however, I am sure there are many more blogs and tweets than they mention. I wonder where they get their data — probably just of the share-icons on their site, eh? Maybe, but I think it might be a bit smarter than that. May take a few days to pull stuff but yeah basically I have no idea! This is a great review, Chris. Nice work! I didn’t get into the question of intuitive cognitive biases in my piece, but that section of Corriveau’s paper was also pretty poorly reasoned and poorly researched. The “born believers” people, like Barrett, Kelemen, Bering, etc., don’t argue that kids come out of the womb primed to believe in Abraham and the Christian God. Instead, as you point out, they come out primed to think in certain ways (e.g., teleologically, agentially) that make theism a slightly more cognitively natural “setting” than nontheism, overall, across cultures, across time, generally. And local exceptions to the near-ubiquity of theism are always, always found in high-income, high-complexity societies – exactly the type of cultures that can pump energy into countering native cognitive biases through education and enculturation. Good points Connor! The only caveat I would add is that Justin Barrett’s preparedness hypothesis comes close to arguing for a prime for a monotheistic deity but that remains controversial and isn’t an essential component of the general ‘born believers’ argument.